Joy Creek Photo Archive (c) all rights reserved Miscanthus sinensis var. 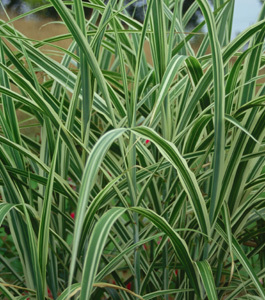 condensatus 'Cosmopolitan' is almost the reverse of Miscanthus 'Cabaret' with white edged blades and a rich green central midrib. The towering inflorescences bloom very late here. A Great Plant Picks selection.